Click Here and become a member of StJohnOnline.ca/CadetsOnline.ca! Membership on StJohnOnline.ca/CadetsOnline.ca offers you the ability to be notified of all newly posted Newsletters, Memos, Manuals, News Releases along with your ability to contribute to our discussions. Register online with StJohnOnline.ca/CadetsOnline.ca and become a virtual member of our St. John site. 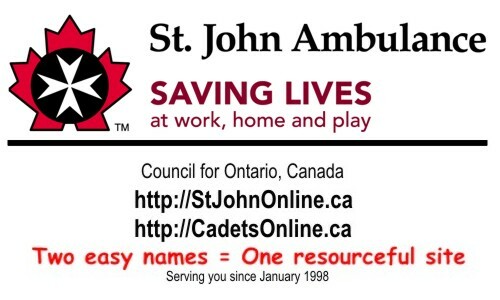 This Area is comprised of official news releases, manuals, memorandums, policy statements and guidelines of St. John Ambulance - Council for Ontario. You may view and access all of these online resources; but you may not post any entries yourself. This Area is comprised of unofficial manuals, memorandums, photo galleries and guidelines contributed by virtual members to assist other divisions. You may view and access all of these online resources and contribute to these resources as well. We ask that only useful resources or small photo galleries that you wish to share with others be posted here. This Area is comprised of unofficial discussions and opinions from our virtual membership. You need to register and authenticate yourself as an online member to post and contribute to these discussions; otherwise you may only read our discussions. We have started to expand our focus and ask you to do the same by placing your discussion in the appropriate topic area. Due to increased spam traffic, our guestbook area is no longer able to accept unregistered user postings. Registered users wishing to use this general purpose area are still invited to do so. We welcome all visitors of our site and hope that we will be able to provide you with all the information necessary to educate people about our many Community Service programmes. Whether you are a young person between 6-21 years of age, an Adult interested in Patient Care, a Dog owner who feels that they and their pet have what it takes to make someone's day or a kid-at-heart interested in volunteering with our youth programme as a youth leader, we hope to hear from you! Unlike so many of the current web sites on the Internet today, our site is one worth book marking if you are involved at all in our organization. This site is not a static site. This site changes dynamically as people like you visit it! Comments, questions, answers, discussions, solutions, useful resources and links can all be found within our pages. Better yet; our pages update themselves with your input!! !